When even the far left Guardian shows you as being deceptive and unethical about one of their favorite left win causes... you are done. When news anchor Katie Couric debuted her documentary Under the Gun earlier this month, she billed it as a balanced look at the gun control debate. There was a “huge silent majority” of gun owners, she said, who supported moderate gun control measures, and that many National Rifle Association members did not agree with the group’s political positions. Just two weeks later, Couric and director Stephanie Soechtig are under pressure over what many observers are calling deceptive editing of a key moment in their film. The leader of a gun rights group featured in the documentary says the film edited out gun owners’ responses to one of Couric’s questions – and instead has them sitting in silence, looking “stupid”. On Twitter, gun rights advocates dubbed the incident #Gungate, and the NRA is asking members to sign a petition demanding Couric be fired from her job as a global news anchor at Yahoo. In the email, Kristin said, “Some of the storylines we’re exploring include the legislative process on the federal and state level, how the Second Amendment has been interpreted in the wake of the Supreme Court’s Heller ruling, and what impact mass shootings like Aurora and Sandy Hook have on gun reform legislation.” She continued, “In order to fully understand the complexities of this hot button topic and speak to an audience with varied viewpoints, Ms. Couric is very eager to include all perspectives in this discussion." Fortunately, one of the gun owners in the sequence, VCDL President Philip Van Cleave, recorded the actual event before it was edited to make gun owners look like mutes. There was no pause. The members offered several answers. They were omitted from the documentary, with a pause inserted instead to bolster an anti-gun agenda. The .38 revolver was obtained illegally. Quinones may have been involved in illegal activities. While Quinones struggled with one man the other fired two shots in his direction. He "disengaged from the struggle" and the men ran around the east side of the building toward Ash Street, police said. Quinones quickly grabbed a loaded revolver that he had hidden nearby under a row of bushes along the back side of 208 Ash St., police said. Quinones ran around the west side of the building toward Ash Street. When he got to Ash Street Quinones again encountered the two robbers. It was then that one of the robbers fired several shots toward Quinones, police said. Quinones returned fire, hitting the man in the head and causing his death, police said. .380 has a maximum diameter of .374. A .38 Special has a case diameter of .380. Thus a .380 does not have a way to head space in a .38 Special chamber. For the uninformed, a box of ammunition labled .380 may appear to be correct for a firearm labled .38 Special. If Terry Frost did try to fire his gun, he was unsuccessful because he had the wrong type of ammunition in his gun. Police confirmed to FOX 45 sister station Local 12 in Cincinnati that Frost was carrying a .38 Special but had loaded .380 ammo. Cincinnati Police Chief Eliot Isaac said there had been an attempt to fire the gun but they can't be sure it was during that robbery at the Fifth Third Bank on Madison Road. Hillary Clinton has castigated Bernie Sanders for voting for a federal statute that she says provides “absolute immunity” to firearms manufacturers. According to Westlaw’s news database, she made the claim on May 15 (reported in the Guardian on May 16); shortly before the April 5 Wisconsin primary (reported in the Guardian on March 29); at the March 6 debate in Flint, Mich.; on “Face the Nation” on Jan. 10; and at the ABC debate in New Hampshire on Dec. 19, 2015. Her claims must be a surprise to the handgun manufacturer Taurus, which has agreed to pay up to $30 million (plus $9 million in attorneys’ fees) to settle a class action involving allegedly defective Taurus handguns. The class action Carter v. Forjas Taurus, S.A. alleges that some Taurus models fire when they are accidentally dropped. The U.S. District Court for the Southern District of Florida has scheduled a July 18 hearing on the proposed class action final settlement; in the proposal, Taurus does not admit the plaintiffs’ factual claims. Further information about the case, including the firearms models and the various procedures for class members, is available here. As a Yale Law School graduate who served in the Senate and who voted against the proposed statute, Clinton would presumably know the statute’s content. It is difficult to understand why she continues to make inaccurate claims about “absolute immunity.” In this post, I will describe what the statute actually does and the concerns that led to its enactment. Vermont has had concealed carry since statehood. It is right next door to New Hampshire, with similar demographics. Vermont's crime rate is slightly lower than New Hampshire's. CONCORD — As expected, Gov. Maggie Hassan Friday vetoed House Bill 582, which would do away with the requirement to have a concealed weapon permit. She vetoed a similar bill last year, and like last year, the House and Senate lack the necessary two-thirds majority to override the veto. A federal appeals court has halted a ruling by a lower court that declared unconstitutional part of the current concealed carry law in Washington, D.C. Under current law in D.C., the police only issue concealed carry permits to individuals who demonstrate a ‘need’ to carry a weapon. D.C.’s “good reason” clause has restricted concealed carry permits from being issued for almost any reason in D.C.
A gay rights group, the Pink Pistols, is leading the effort to overturn the restrictive gun law. The group joined a resident in the case which overturned D.C.’s strict law before the stay. Bryce Dejean-Jones was shot after he broke into an apartment, then broke down the bedroom door, all without attempting to identify himself. The young and talented basketball player may have believed that he was breaking into the apartment of the estranged mother of his 1-year-old child, which has been reported to be a floor above in the same apartment complex. Having visited the woman recently, he may have known that she was unarmed. Dejean-Jones, a 23-year-old shooting guard with the National Basketball Association team, kicked in the front door of an apartment, police said in a statement. The noise woke up the resident in his bedroom, they said, and Dejean-Jones failed to respond when the man called out. When Dejean-Jones kicked the bedroom door, the man shot him with a handgun, the statement said. 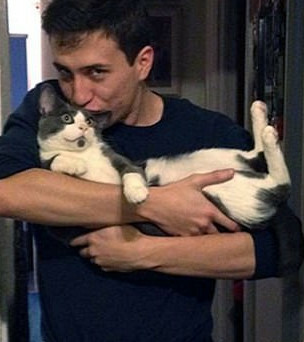 Dejean-Jones collapsed in the apartment's breezeway and died at a hospital. The shooting is under investigation, police said. Dejean-Jones was "believed to be breaking into the apartment of an estranged acquaintance" but entered the wrong one, the apartment complex manager said in an email to residents obtained by Dallas NBC television station KXAS. Dejean-Jones was shot once in the abdoment with a handgun. No toxicology reports are available at this time. The incident occurred at a home on Cathleen Drive in Burtonwood Village. At approximately 11:30 p.m., a male suspect identified as Porter, was observed inside of the victim's shed by a neighbor. The neighbor, 58-years-old, armed himself with a .38 caliber revolver and responded to the victim’s house to notify him. Once the victim, 43, was contacted, he went to his shed and was confronted by the suspect who was armed with a knife. The suspect allegedly came towards the victim with the knife, so the victim attempted to close the shed door to protect himself. The suspect was halfway out of the shed jabbing the knife towards the victim and neighbor, when the neighbor told him to drop the knife several times. The suspect refused to drop the knife, so fearing for the safety of the victim and himself, the neighbor shot the suspect one time in the face. said state police spokesman Cpl. Jeff Oldham. confronted by the intruder, who was armed with a knife, Oldham said. knife, but he kept trying to stab them, Oldham said. until state police and medical personnel arrived, he said. They were not injured. Be wary of stories without dates in the story itself. THE BRONX - A 22-year-old Olinville man called 911 Tuesday and told the operator that he shot a burglar in his home with the intruder's own gun, police say. Officers were dispatched to a home in the 1900 block of Winoca Road just after 1:15 a.m. regarding a burglary in progress call. When officers arrived on scene, they located an adult male suffering from gunshot wounds outside the house, officials said. The owner of the home told officers that he heard the man trying to kick the door down and then told the man to stop. “I got my gun and went to the door there and went there to the hall and told him to hold it, hold it, and they kept right on kicking it. Hold it, hold it, hold it,” said Paul Morgan, who fired the shots and lives at the house. When the man didn’t stop, he fired shots through the door. On Monday, April 4th, about 11:00 a.m., a firearms instructor who was openly carrying a .40 caliber semi-automatic pistol, shot and killed Shawn Breland at a gasoline station and convenience store. Twelve days later, I wrote about the incident and published the article on Gun Watch and The Truth About Guns. There was some disagreement about the incident as described, and people at the Truth About Guns (TTAG) forum were of varied opinions. This is a case of a bystander getting involved in a common argument between an employee and customer. How many of you have gotten mad at an employee somewhere due to the way you were being treated? This man threatened an unarmed man with a firearm, and when he couldn’t handle the man, he shot and killed a husband, father, and honorable veteran. He should have not gotten involved. The police were already on the way. If he wanted to be in law enforcement, then he should have joined the Mandeville police dept. The man was getting in his car to leave when this wanna-be cop came out telling him he was getting his license plate. He is not a trained law enforcement officer and his mishandling of the situation caused a good man having a bad day to lose his life. “The shooter followed Breland outside to get the license plate from Breland’s white minivan. Breland got out of the minivan and physically attacked the shooter, Ruple said.” If you are going to make claims that contradict what is published, please provide a source for your information. I am commenting specifically on the information I have available which is: He (the shooter) went outside to get the plate number and Breland RETURNED to the continue the confrontation. Did the shooter contribute to the escalation? I don’t know, and I am not commenting on that. What I am commenting on is the completely idiotic, Statist notion that we all have to be “trained law enforcement officers” to act in any situation. There was video of the event. I wonder if it will be released. A legally-armed citizen who fatally shot an attacker at a Mandeville convenience store in April will not be prosecuted, St. Tammany Parish District Attorney Warren Montgomry said Friday (May 27). Mandeville police investigators concluded Shawn Breland, 42, of Folsom, was the aggressor at the Shell gasoline station and convenience store at 3959 Louisiana 22. "Although Mr. Breland's death is a tragedy, this office agrees that the shooting was legally justified under the circumstances and will not pursue criminal changes based on the evidence submitted to date," Montgomery said in a news release that included surveillance camera video of the incident. (See video above. Warning: graphic content). I personally spoke to a man that was there during the entire situation. The shooter did not walk quietly out to get the license plate. He confronted him stating that he was going to get his license plate, in turn escalating the situation. THE MAN WAS LEAVING. If the shooter would have minded his own damn business, a good man would be alive today. Armed citizens trying to play cop have far too often lately found themselves in situations that end in them shooting and killing UNARMED people. As you watch the video, much that happened becomes clearer. Pictures convey so much information that multiple replays may be necessary to catch relevant details. Digital recording is making "he said" "she said" controversies less common. The video greatly increased my understanding of this case of an open carrier defending himself and others. The brother of a slain Border Patrol agent says Donald Trump has promised answers about the Operation Fast and Furious “gunwalking” program leading to Brian Terry’s death. Kent Terry met with Trump, and says the presumptive Republican nominee will use his authority to act if he’s elected president, Terry said in a Twitter post Tuesday. This is not only newsworthy, it could prove explosive. It could provide the necessary authority to break the logjam and allow the complete truth about Operation Fast and Furious “gunwalking” to come to light. It’s not unfair to speculate that could put the fear of God into some of those who have tried their best to keep the truth buried, and would up the stakes for involved Democrats to keep Trump from getting elected. It would also be tremendously beneficial to his campaign, and to rallying Americans sick of the cover-up and demanding of justice. But only if that pledge is publicly acknowledged. During the course of the matter, the case against Todd had been ordered back to the grand jury three times by Haws. In his most recent remand order on Dec. 17, 2015, Haws found that the prosecutor did not read grand jurors a statute that would have properly advised them that the defensive display of a weapon is justified when and to the extent a reasonable person would believe that physical force is immediately necessary to protect oneself against the use or attempted use of unlawful physical force or deadly physical force. As such, Haws determined that the state's failure to advise grand jurors of the statute deprived Todd of a substantial procedural right. Instead of the case being returned to the grand jury a fourth time for a determination of probable cause, the prosecution chose to hold a preliminary hearing on the matter. The fatal shooting of 53-year-old Mark Penland during a disturbance at an Ocala residence two months ago was justified, prosecutors have determined. The State Attorney's Office memorandum states that his wife, Michelle Dinkins-Penland, had a right to protect her family and therefore no charges would be filed against her. Investigators said that man apparently pulled out a knife and acted in self-defense. “It appears that would-be now potential suspect, who we were looking for, is actually a victim of the robbery, and in self-defense, he stabbed two kids as they attempted to do this robbery,” McKeone said. HENDRICKS COUNTY, Ind (WISH) – A man becomes his wife’s hero, after fighting off an intruder. That intruder, police say, was her ex-husband who was wielding nunchucks. It happened Tuesday night in the 2000 block of State Road 267 near Avon. The suspect and victim divorced almost 10 years ago. Since then, the victim said she’s had to have a restraining order against her ex-husband and there has been a history of violence. But, since they have two children together, she calls the shooting bittersweet. 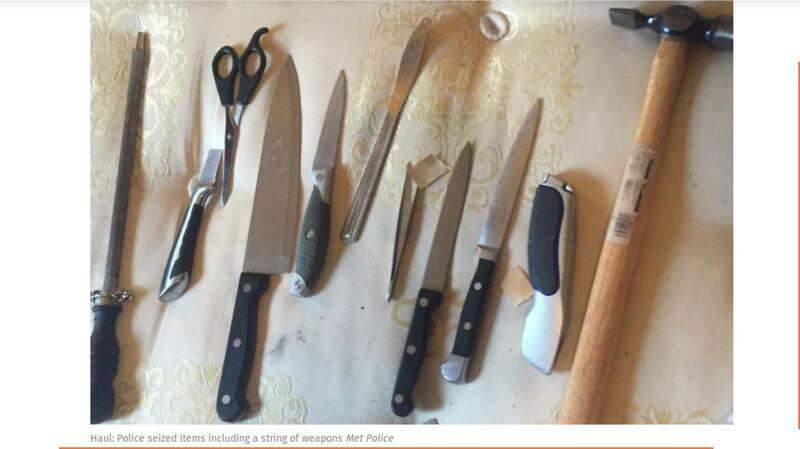 UK: Weapons Cache, Table Knives, Tweezers and Hammer? A haul of weapons and more than £30,000 in cash were seized by police in a major drugs bust this morning. I thought the U.S. was being converted to a bunch of wimps. This is pathetic. Any normal 15 year old could come up with better weapons than this collection from the kitchen drawer and utility closet. A golf club or Cricket bat would be more formidable. A tip of the hat to Just an Earth-Bound Misfit, I. The Metropolitan Police must be hard pressed to justify their jobs. No wonder the Muslims think that they can easily conquer and convert Europe. A strong right to keep and bear arms amendment to the Oklahoma state constitution was killed by the Republican leadership at the last minute. They did this by running out the clock in the conference committee, by not voting on HJR 1009. The clock ran out on May 19th. The tactics were similar to what was done in 2014. This year the measure was passed with overwhelming votes in both the House and the Senate. It passed the House 66-7. It passed the Senate 39 to 7. That is by 90% and 85% respectively. Obviously, the measure was wildly popular. Then some lobbying by special interests seems to have gotten involved. Backroom deals may have been struck. Several Republican members of the House Rules Committee (which is the House side of the Conference Committee for HJR1009) that previously voted for HJR1009 - most of them twice - and have even signed on as co-authors of the measure, have suddenly flip-flopped on the issue. One of them even seemed to get a kick out of the possibility of killing it. Are you angry yet? Republicans laughing about trampling on your right to keep and bear arms while following marching orders from a liberal, New York, gun-grabber lobbying against your natural right to protect yourself - that should make every pro-gun Oklahoman livid! You can see the problem "; but nothing herein contained shall prevent the Legislature from regulating the carrying of weapons." With that clause, the court has ruled that the "bear arms" part of Section 26 is a legal nullity. 17 involuntarily committed in any mental institution. Reformed Constitutional amendments protecting the right to keep and bear arms have been wildly popular with voters. The difficulty is getting them on the ballot. 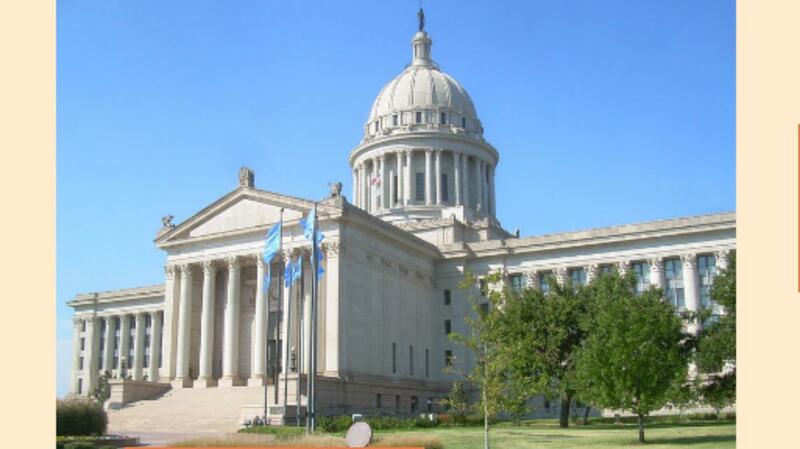 In 2014, the Oklahoma amendment passed both houses in slightly different versions. It was scuttled in the conference committee between the House and the Senate. Alabama passed a similar amendment in 2014 with 72% of the vote; Missouri had strengthened its Constitution just months before with 61%; Louisiana in 2012 with 74% of the vote; and Kansas in 2010 with 88%. Wisconsin voters protected their rights with a strong amendment in 1998 with 74% of the vote. Wisconsin had one of the most difficult paths. Constitutional amendments there must pass the legislature twice, with an election in between. Then they are put before the people in a referendum. The legislature has not yet learned that playing these games is no longer a safe way to kill measures that you vocally support, but secretly conspire to kill. Perhaps ok2A-action.org will determine just who the responsible parties are, and find a way to hold them accountable. I believe this amendment will eventually make it to the voters for their decision, but it will depend on grass roots support to make it happen. The evolution of gun rights has an internal legal logic to it. The contemporary story starts in 2008 with the case of D.C. v. Heller, a 5-to-4 decision in which the Supreme Court declared for the first time that gun ownership was an individual right, not a collective right of “the people” to organize into militias. That characterization of the Heller decision is a favorite of disarmists, but it is false. The Supreme Court never found that the Second Amendment was a "collective right". The "collective right" theory was created out of whole cloth by the Kansas Supreme Court in 1905. The muddy Miller decision in 1934 did not say that the right was a collective one, even though that test case was heavily manipulated by the Franklin Roosevelt administration. There are plenty of previous Supreme Court decisions that declare the Second Amendment to be an individual right, though they do not strike down laws. That leaves the view that there’s something special about weapons that can be used both for self-defense and for militias. According to Scalia, those are the weapons that the people who ratified the Second Amendment had in mind. But that view is nonsense. First, AR-15s are not "assault weapons". They are the civilian version of the M-16, having been altered to make them semi-automatic. That makes them specifically designed for civilian use and useful both for self defense and militia use. Second, many firearms experts extol the virtues of AR-15 and similar rifles as being especially suitable for home defense, for all the reasons that they would be useful in military operations. They are light, easily used firearms. They give a defender a fighting chance against superior numbers. There appearance has become so well known that they provide superior deterrence for a home or self defender. They are precisely the firearms that are most useful for spontaneously organized militias to use to assert order after a natural or manmade disaster. Feldman asserts that the Court will not accept this view, because then they would have to accept rocket-propelled grenades and other weapons as well. But that is a false assumption. The Court has already accepted a limit by allowing more regulation on fully automatic weapons. Feldman does not appear well schooled in weaponry. He makes the novice error of assuming that because AR-15 type rifles are included in legal definitions of "assault weapons" that they are "assault rifles". It is an easy error for a lawyer to make. Rocket propelled grenades are already in a separate federal legal category from semi-automatic rifles. That line is likely where the current court will hold on Heller and Heller generated challenges to the Second Amendment. 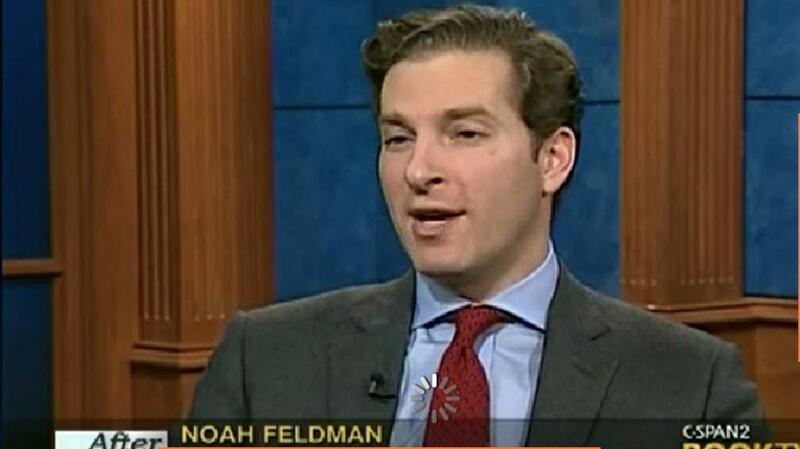 It may be that Noah Feldman will come around to this view. He seems to value intellectual honesty, in spite of his errors. If he comes to understand that disarming the population does not confer any real advantages to society, he may switch sides. He seems to be moving in that direction. AR: Poll: Should the University of Arkansas Allow Concealed Carry? An online poll arkansasonline is showing the strong support for allowing people who can legally carry concealed weapons to carry on campus in Arkansas, just as they can in the rest of the state. Should the UA System allow concealed-carry at its schools? Currently the poll is at 92% for restoring the right to bear arms to public property that is part of the University of Arkansas system. On line polls measure the ratio of those who are interested enough to answer an online poll. The results here are typical. Second Amendment supporters typically outnumber those who push for more restrictions by 3-10 to 1. In this case the ratio is now over the 10-1 ratio. This poll is asking a fairly clear question about the desirability of allowing the exercise of a basic Constitutional right on public property. People in Arkansas tend to be strong Second Amendment supporters. It is not surprising that they would support this small, incremental step to restoring a right that many believe they have always had. The poll in Arkansas is topical because legislators around the country are debating whether to restore Second Amendment rights to institutes of higher education. Last year, a campus carry bill passed the Arkansas House 66 - 25. It was killed in committee. Campus carry was supported by Governor Hutchinson. If you work at a Texas college and are worried by the prospect of having guns in your classroom, relax. The new campus-carry law changes your risk of gun violence very little. I can almost guarantee that if you have a few semesters of teaching under your belt, at some point there have been students with guns in your classroom. If those illegally armed students were not moved to violence by the content of your course or the statements of their fellow students, it seems highly improbable that a new group of legally armed students will prove to be more volatile or violence-prone than their scofflaw peers. Texas A&M University’s proposed new campus carry rules include few major restrictions for handguns and will allow the weapons in classrooms and dormitories. The proposed rules have been approved by Chancellor John Sharp and A&M System legal staff. They will be reviewed by regents later this month. State law doesn’t require board approval of campus carry rules, but does allow regents to amend the rules if they disagree with them. Institutes of higher education have become centers of "progressive power". Legislation that insists that they respect rights guaranteed by the Constitution, threatens the basic assumption of that power; that experts know what is best and that the government should not be limited. Campus carry will likely come to Arkansas, sooner or later. Police say that at 5:30 p.m. Thursday, a driver on the Glenn Highway said he pulled over for an unmarked white Ford SUV. The SUV flashed red and blue interior dash lights. The man called 911, and told police that he watched as the SUV did the same thing three other times with other drivers. At the time that the incident was reported, the police checked the license plate of the vehicle, but could not find a match. Four days later, investigation revealed that the vehicle was an unmarked vehicle registered with the Bureau of Alcohol, Tobacco, Firearms, and Explosives, (ATF). The vehicle was not in the Department of Motor Vehicles data base. It was an unmarked ATF vehicle whose official existence is shielded from ordinary police view. This was discovered by a computer search though thousands of police reports. It happened that the ATF vehicle was at the scene of another investigation, and an investigating officer had noted the vehicle plate number in their report. Police contacted the Bureau of Alcohol, Firearms, Tobacco and Explosives, a U.S. Justice Department agency, which confirmed that the SUV was theirs, Castro said. The person driving the ATF owned Ford SUV has not been identified. Initial reports describe the driver as a white male in their 30s with short hair. ATF has a policy not to "comment on personnel matters". This is not a mere "personnel matter". If the allegations are true, this is an abuse of authority. It is a blatant violation of law. It is a deprivation of rights under color of law. If it occured as alleged, it should be easy to ascertain the truth, and the ATF official should not be allowed to be shielded by the agency. Using police lights to pull someone over without cause is depriving them of their constitutional rights under the Fourth Amendment. It is hard to believe, given the description of events, that the person in the vehicle had a legitimate reason to pull the vehicles over. The abusive finger salute adds to the impression that this was a simple abuse of authority under the color of law. It was a minor abuse. Damages under 42 U.S.C. § 1983 would likely be small. It is roughly the equivalent of the abuse of police officers using lights and sirens to go on a pizza run; or using their police identification to push to the head of a line for personal reasons. But it is exactly these sort of abuses that are very damaging to the rule of law. Citizens see the abuses. They see that nothing is done to correct them, and they conclude that officers consider themselves a special class, above the ordinary rules of society and the law. Such abuses make the allegations in more serious cases, such a the Fast and Furious gun running case, all the more believable. In that case, it is alleged that the Department of Justice conspired with the ATF to facilitate the illegal transfer of firearms to Mexican drug cartels, for the purpose of pushing the Obama Administration's policies on gun control. Digital recording devices make these abuses of authority under color of law much easier to prove. At least two appellate courts have ruled that it is a First Amendment right to video/audio record public officials in the course of the public execution of their duties. A U.S. District Court in Pennsylvania has refused to recognize recording as a First Amendment right, when there is no intention of criticising the police; that case is being appealed to the Third Circuit. The case would not apply to those who record police with an intention to criticise their actions. Criticism of police is at an all time high under the Obama administration. Many of the criticisms have not been justified by later investigations, such as in the Trevon Martin case or the Ferguson shooting case of Michael Brown. That does not mean that abuses do not occur. It makes the case that recordings of altercations can help to absolve the innocent as well as convict the guilty. The ubiquity of digital recording devises is helping to make all authorities more accountable for their actions. WESTLAND, Mich. (WXYZ) - A 24-year-old Westland man was shot and killed after he allegedly took part in a home invasion at a house on Glenwood Thursday morning. The 23-year-old man who lives in the house was shot in the leg. Yesterday, Pavlich wrote about Katie Couric being busted for deceptively editing her group interview with members of the Virginia Citizens Defense League. Couric has a new anti-gun documentary, Under the Gun, and it seems the folks behind this piece of propaganda were doing everything they can to make pro-gun activists look like idiots. In the clip, Couric asking “if there are no background checks for gun purchasers, how do you prevent felons, or terrorists, from walking into a licensed gun dealer and purchasing a gun?” The feature shows seconds of silence as to insinuate that Couric has stumped them. It’s pure unadulterated crap, as Stephen Gutowski of the Free Beacon pointed out with the unexpurgated audio clip that took place. When police got to the home they saw the homeowner applying pressure to a gunshot to Claunch's neck. The homeowner, who is in his 70s, told police the man approached while he was doing yard work and punched him in the back of the head. The homeowner said the man continued to beat him and even "mounted" him to hit him. Officers said the homeowner was carrying a gun and fired a warning shot then fired another shot in the man's neck. Doctors performed emergency surgery on Claunch, and at last check, it's not clear if he is going to survive. Police say a Tulsa woman shot at two men who broke into her house near I-44 and Garnett. One suspect is in the hospital and the other is still on the run. Brockton Massachusetts held their first gun turn in or "buy back" in 22 years on 21 May, 2016. "Buy Back" is a propaganda term; the guns were never owned by the people who are buying them. In exchange for each gun turned in, a $200 gift card to Vicente’s grocery store will be given. The gift cards were paid for using forfeiture money that has been seized by the police from drug arrests and raids that led to convictions. The event seems to have had 9 pistols turned in, two shotguns, a rifle, and a couple of BB guns. It is unlawful to conduct a personal sale or transfer of a weapon to anyone other than an individual lawfully licensed in the Commonwealth of Massachusetts. It is strongly recommended that you require the buyer/transferee to produce a valid FID/LTC License Validation Certificate (obtained by the buyer/transferee using this system) prior to conducting a personal sale or transfer. You may need your PIN number to complete a transaction. You may obtain your PIN number at your licensing authority. IMPORTANT NOTICE: Massachusetts law requires all gun owners to report ALL private sales, transfers, and surrenders of firearms to the Massachusetts Firearms Records Bureau via the Massachusetts Gun Transaction Portal. Paper FA-10 forms are no longer accepted for these transaction types. It is too bad that private purchasers were unable to participate in the Brockton Turn In event. There were some very nice revolvers turned in for the $200 gift cards. The three Colt revolvers were likely worth about $600 each on the open market. They are not made any more. The Smith & Wesson model 15 would be worth about $600 or more. The center revolver is likely a Rossi or a Taurus, probably about a $250 pistol. The other four pistols are inexpensive, and would bring about $50 to $100 on the open market. $200 was generous compensation for them. A criminal justice professor and former police officer admits the program is primarily a propaganda measure. The professor does not mention that a WWII Luger is likely worth 5 to 10 times the value of the gift card offered. Those who brought the cheap handguns did well. Those who brought the Colts and Smith were taken advantage of. "It’s not my determination of the 'right hands,'" Tassell said. "It’s the federal government's decision." Gun turn in events, or "buy backs" are dwindling as Second Amendment supporters have learned to negate their propaganda value with private buyers. The events will linger on in states such as Massachusetts, where private sales suffer under many infringements, or in programs such as Street Rescue, where the emphasis is on efficacy instead of propaganda. Criminals tend to be optimists, at least when it comes to carrying out crimes. They often envision only one scenario, and assume that everything will go as planned. It is one of the reasons that many criminals depend on imitation, toy, or replica firearms. A number of states treat the use of a replica or imitation gun the same as the use of a real gun in a crime. No state requires a defender to determine if a gun pointed at them is real or imitation. There is no controversey in the law about that. If the defender reasonably believes that they are under deadly threat, it does not matter if the perpetrator was using an imitation gun. Imitation guns are less expensive and a bit easier to obtain than real guns. DALLAS (AP) -- Police in Texas say more crimes are being committed with imitation weapons such as BB guns, likely because they're cheap, easy to obtain and criminals may believe -- mistakenly -- that if they're caught, they'll avoid the severe punishment that can come with illegally possessing a real one. Should the use of imitation firearms in crime be subject to the same penalties as real firearms? I submit that penalties for the use of imitation firearms in crime should be less. The criminal is putting the victim(s) at lower risk, and is putting themselves at higher risk. This is behavior that should be encouraged. It is good public policy to reward this behavior with lower penalties, just as non-confrontational crime has lower penaties than crimes that occur in direct confrontation, such as robbery. I would prefer to confront a robber armed with an imitation gun instead of a real one. I would prefer to confront a robber with an imitation gun instead of a knife or club. Many criminals are ignorant of the law, so incentives do not always have a significant effect. In this case, the law would reinforce an existing belief, so the chance of success is greater. Replace criminals guns with imitation guns? We should encourage this trend. Canada passed its long gun registration scheme in 1995. The bureaucratic attempt to require state knowledge and tracking of all legal guns in Canada was a disaster from the beginning. It was plagued with non-compliance, sabotage, corruption, crony-ism and cost overruns. Advertised as costing only 110 million, the costs ballooned into billions, as the ruling party used the program to reward favorites, and paid consultants to lobby to increase registry funds. The registry was discontinued on April 5, 2012. Quebec fought to keep the registry in courts, but was ruled against in the Canadian Supreme Court a year ago. There never was any data showing that the registry had any effect on crime. It appears the RCMP, at the minimum, assured that no data was kept that would indicate if the registry was of any use as a crime fighting tool. No instances could be found where the registry was useful in solving crimes. New Zealand had eliminated its long gun registry in 1983. Police had determined that the registry was ineffective in reducing crime. But Brisebois believes the registry is more than just a tool for law enforcement — that it’s a symbol of how a society treats firearms and that it reinforces Canada’s cultural differences from those of the United States. “Seeing what the registry did for me — spend the money,” Brisebois said. Brisebois does not want symbols of liberty and rights. It does not matter that the registry is expensive and ineffective in fighting crime. The Canadian Supreme Court even refused to hear a case put forward by leftist feminists, claiming that doing away with the registry violated their rights. The reason the court did this? Because there was no evidence that the registry had reduced crime one iota. Interestingly, this is a very similar reason given for the great forced Australian gun "buy back". Prime Minister Howard said that he hated guns and did not want Australia to go "the American way". The long gun registry was never popular in Canada. It was put forward as a way to punish cultural conservatives, to show rural and western Canadians who was in charge, and it was not them. Canadians educated themselves. They lobbied. They voted. They rid themselves of the registry. Similar situations are occurring in many American states. The compliance with long gun registration schemes in New York, Connecticut, and California are at 4-10%. Whether that resistance will result in political changes is uncertain. Sgt. Steve Stroud says the homeowner told police he heard someone trying to kick in the door to his house. He told police he warned the intruder to stop before firing shots through the door. The victim was taken to Wilson Medical Center, where he died. Daniel McNamara and his wife were being held at gunpoint. He had a gun stashed in the area where he was being held. He accessed the gun and fired two shots, driving off the intruders. He was worried that the intruders were going to kill them because they had seen the intruders faces. The link is to the video report. Many people have said or written that while Donald Trump supports the Second Amendment, talk is cheap, and we do not have actions to back up the talk. There is some truth in that. Donald Trump does not have a legislative record to show actions to back up his words. But words have meanings. If a nominee is unwilling to give us words in support of the Second Amendment, why should we believe that he will go to bat for us in the legislature, in the executive branch, or in the courts? If the nominee is too concerned with being politically correct when running for office, even in the primary, why should we believe that they will be willing to take more heat while in office, facing re-election, or under media pressure? If a nominee will not specifically defend the Second Amendment verbally and in writing before being elected, why would we expect them to do so afterwards? Here is the record of Republican nominees over the last hundred years to see how they compared with Donald Trump. The Second Amendment was not an issue before 1968. In 1932 Franklin Roosevelt had pushed through the first serious federal gun control law. It impacted few people at first. It only had an effect on machine guns, short barreled shotguns and rifles, and silencers that crossed state lines in interstate commerce. Most people paid little attention to the onerous regulations and taxes that were imposed. There were few prosecutions. At a young age, Barry Goldwater was taught by his mother how to shoot rifles and shotguns. He believed that gun control was “impossible,” and served as an NRA spokesman, appearing incommercials for the group. He was also an avid gun collector, devoting an entire room of his houseto a variety of guns that he had both made and purchased over the years. Twenty years ago, I asked Richard Nixon what he thought of gun control. His on-the-record reply: "Guns are an abomination." Free from fear of gun owners' retaliation at the polls, he favored making handguns illegal and requiring licenses for hunting rifles. FORD: The record of gun control, whether it's in one city or another or in some States does not show that the registration of a gun, handgun, or the registration of the gun owner has in any way whatsoever decreased the crime rate or the use of that gun in the committing of a crime. The record just doesn't prove that such legislation or action by a local city council is effective. What we have to do--and this is the crux of the matter--is to make it very difficult for a person who uses a gun in the commission of a crime to stay out of jail. I don't believe in the registration of handguns or the registration of the handgun owner. That has not proven to be effective. And, therefore, the better way is to go after the criminal, the individual who commits a crime in the possession of a gun and uses that gun for a part of his criminal activity. I had always opposed federal registration of guns or the licensing of gun owners, and as President, I hadn't changed my views. At the same time, I recognized that handguns had played a key role in the increase of violent crime. Not all handguns-just those that hadn't been designed for sporting purposes. I asked Congress to ban the manufacture and sale of these "Saturday night specials." [In a 1991 speech, Reagan said]: "I'm a member of the NRA. And my position on the right to bear arms is well known. But I support the Brady bill and I urge the Congress to enact it without delay. It's just plain common sense that there be a waiting period [7 days] to allow local law enforcement officials to conduct background checks on those who wish to buy a handgun." The Brady bill was opposed by the current President, George H.W. Bush. "I don't think it would be proper for me or any other ex-president to stand and tell an acting president what he should or shouldn't do," Reagan said. But then he added: "I happen to believe in the Brady Bill because we have the same thing in California right now." He was asked why he had opposed all gun-control measures while he was President. He shook his head. "I was against a lot of the ridiculous things that were proposed with regard to gun control. George Bush Sr. was at best a lukewarm supporter of the Second Amendment. Bush exacted his revenge in May 1995, when he read about an NRA fund-raising letter that described federal agents as "jack-booted thugs". Ripping up his NRA membership card, Bush wrote a letter of resignation, which his office made public. He accused the NRA of slandering dedicated officials "who are out there day and night laying their lives on the line for all of us." Robert Dole was lukewarm on the Second Amendment. I was surprised to see that Senator McCain had some positive positions on Second Amendment issues. His actions were far less supportive. ROMNEY: Yeah, I'm not in favor of new pieces of legislation on guns and taking guns away or making certain guns illegal. We of course don't want to have automatic weapons, and that's already illegal in this country, to have automatic weapons. What I believe is we have to do is to make enormous efforts to enforce the gun laws that we have and to change the culture of violence we have. And you ask, how are we going to do that? Good schools, to give people the hope and opportunity they deserve, and perhaps less violence from that. But let me mention another thing. And that is parents. We need moms and dads helping raise kids. TRUMP: -- I promise there wouldn't have been 130 people killed and hundreds of people lying in the hospital to this day. It might not have happened. Because if they knew there were guns in the room, it might not have happened. But if it did, you would have had bullets going in the opposite direction. And believe me, the carnage would not have been the same by any stretch of the imagination. Mr. Trumpmade the arguments in a “position paper” on the Second Amendment in which he makes the case that people who don’t break the law should be able to obtain a concealed carry permit allowing them to carry in every state, and that members of the military should be able to carry their arms on military bases and at recruitment centers. And this whack-job walks in and starts shooting and killed all five of them. Gun-free zones. We are getting rid of gun-free zones. OK? I can tell you. But Hillary Clinton wants to abolish the Second Amendment. We are not talking about change it. She wants to abolish the Second Amendment. We're not going to let that happen. I can tell you. That we're going to preserve it. We're going to cherish it. We're going to take care of it. OK? They keep chipping away. They talk about the magazines, they talk about the bullets. We're going to take care of it. This is another major difference from previous Republican nominees. None of them talked about the incremental attacks on the Second Amendment. Donald Trump has supported the Second Amendment more forcefully and more specifically than any Republican nominee to date. He has not been in office, so we cannot measure his support with his actions. If he puts into practice even 20% of his proposals to restore Second Amendment rights, he will have done more for the Second Amendment than the last four Republican presidents altogether. His proposals are strongly supported in Congress. The Congress voted down Universal Background Checks. They voted for national reciprocity. They showed support for an end to many gun free zones, such as in the Post Office and on Army Corps of Engineers managed lands. 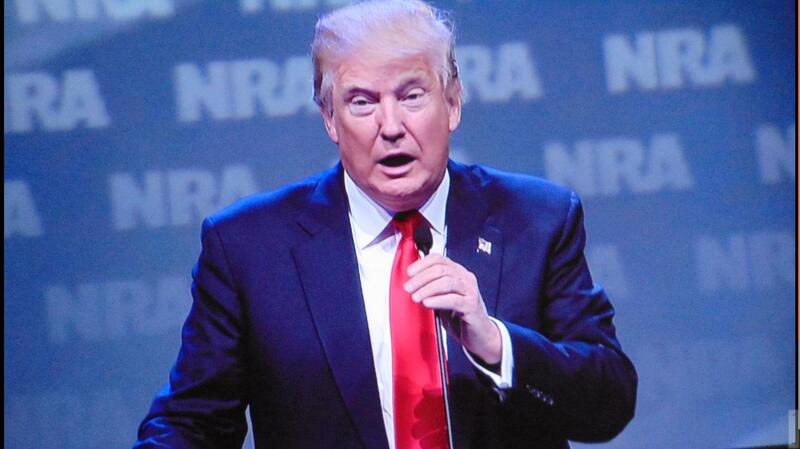 As Commander in Chief, Trump would not need Congress to end gun free zones in the military. Donald Trump could enact many of his proposals. And why wouldn't he? He would have been elected because of them. Under Michigan law, the State Police are required to publish a list of the firearms that they intend to dispose of each month. All the agencies in Michigan are required to turn over to the State Police firearms that have been forfeited or confiscated from prohibited possessors. The firearms are checked to see if they have been reported stolen. If they have not been reported stolen, the State Police are required to dispose of them. Before they are disposed of, the list of firearms has to be published each month. Owners of the firearms are given 30 days to contact the police to recover their property. 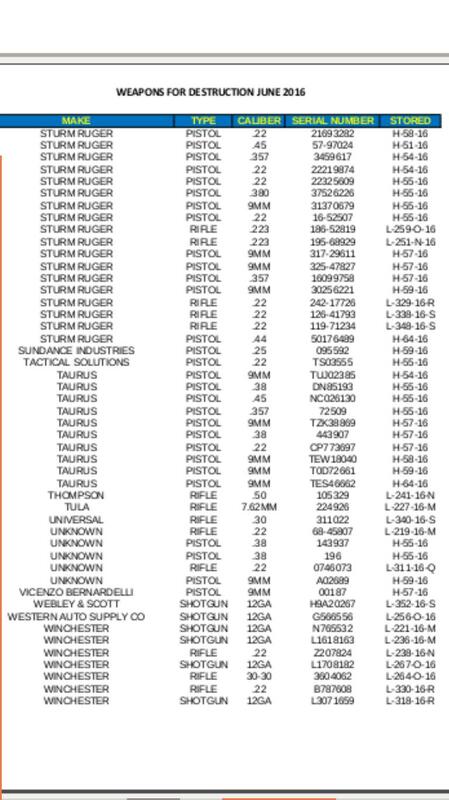 I doubt if many do so; if they have not been listed as stolen, the chances of the owner checking the State Police list each month to determine if their firearm shows up seems vanishingly small. The State Police have the choice to dispose of the firearms by sale or to destroy them. They have been choosing to destroy them, likely for political reasons. It is hard to see why they would avoid selling them at auction. There are 298 firearms listed to be destroyed after June 1, 2016 (pdf). Many are inexpensive. Many are not. They run the gamut from a Webley and Scott 12 gauge shotgun to a Butler .22. The Webley and Scott Shotgun is potentially worth thousands; the Butler .22, maybe $50. Most of them are pistols, 225 of them. There are 39 shotguns and 34 rifles. At auction, confiscated firearms average between $100 and $200 to dealers. It is likely that the Michigan public treasury would gain about $150 per firearm, or about $44,700 for the firearms to be destroyed in the month of July. It is unknown how much the police have to pay to have the firearms destroyed; no doubt they require a paper trail to be sure that none are diverted prior to destruction. That cost would roughly cancel out the cost of having the firearms auctioned. The laws were originally written during the progressive era, at about the same time that registration of pistols was required and short barreled shotguns and rifles were made illegal. The laws were modified in 2010. Disposal requirements are essentially the same under 750.239 (1931) and 28.434 (1927). So why do the Michigan State Police willfully throw away about 40 - 50 thousand dollars each and every month? It adds up to a half million dollars a year. Only the State Police know for sure. A few phone calls did not connect with anyone at the State Police with an answer by the time this was published. If I get an answer, I will add it.